Somethings often cause problems to us at crucial times.I had my IP exams on 29th Dec,2008.We had around 12 days holiday for IP.Hence,we have lesser holidays for SE.On contrary,the MC guys had 22 days off for SE.Am jealous Anurag ehhh!!!!! arggg. I started my IP studies from 23rd and a day off for Christmas.By 26th ,I had completed almost 6 chapters that included Image compression,Segmentation,Transformation.I didn't bothered to touch Image Morphology.Dilation and Erosion are two important concepts in IP.Its an important concept.I tried to learn by my own.At first,I found it easy and I had some different way of understanding the same.Ravi called me and said that its some different method and we needed to take reflection of the structuring elements before matching it with the given image. Few hours I tried to clear my doubts by calling Rahul Jaithwar, who is a good buddy of mine.There were guests in his house and was finding it difficult to study. Me: Yar,tell me abt dilation yaar.Its like matching Str element on image and if any of the 1's match then we write 1 on that naaa. Rahul: naaa dude....when 1's match we write 1 at the origin and not at any location of str element. Rahul: yaar 15 guests hai re.....don't know how I will cope up. Me:chal i call u later....gud luck for exam. Dilation and Erosion are the basics.They are the foundation for Opening,Closing,Thinning,Skeletoning,Thickening,Hit and Miss transformation.By 28th,I am done with almost all topics. On 29th,I got up at 5 am and revised all the concepts once again.Exams started at 10:30 pm sharp.I could see Ravi worried and a very confident Richa sitting behind me.I got my Q - paper.I glanced through it.To vain, there was a question which required definition of dilation and erosion and not concept.I wrote everything about it. 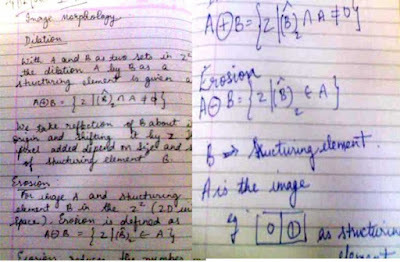 I was very happy as my paper went good.The next day Rahul said" dude,i said naa paper will be easy,"
He asked me to write about this on my blog.Thus I have written it.I finally want to thank Rahul for his generous remarks and advice.Thanx a lot dude.You rock!!. all the best. do well. 12 din mein to mere 3-4 terms k end term exam ho jaen...!! n tujhe itni chuttis ek exm mein milti hain n tu tab bhi rota hai..!!! all the very best STE...!!! SE is a tough subject when you first see it but you will start loving it when you get to understand the real in thing in it...!!! tension mat lena.....everything will be fine..!!! all d best ghisu..lol.. study well!!.. 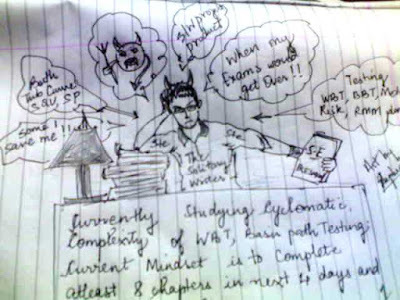 don't worry, paper easy aayega..lol..!! 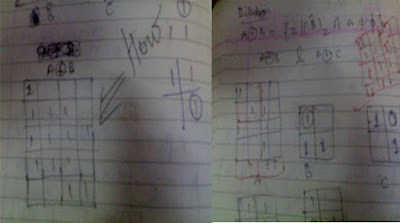 Hey.. this engineering stuff is gettin over my head..CANT get anything of it..anyways... best luck.. do well..! !